In February 1995, as a 39-year-old, late blooming, struggling college student and self-employed single mom on a rare child-free backpacking trip, I stumbled upon the Zapatista uprising. Vaguely remembering that southern Mexico’s indigenous Chiapan population had staged a revolt the year before, I had not heard the news that the Mexican president ordered a militarized hunt for the rebel leader, or that the Guatemalan government called up 3,000 troops to stem the flow of rebels across the remote Guatemalan-Chiapas jungle river border—which I just happened to be motoring up in a tiny fishing boat. Not the sight of two dozen teenage Guatemalan soldiers bathing—their Kalashnikovs lined up behind them—or arriving to Palenque’s sandbag-lined foxholes, armored tanks, and “no photos” warnings from menacing military men deterred my ruin explorations or jungle waterfall swims. Back home, outrage at my own ignorance and the successful pitching of the story of a virtually unknown revolution ignited my journalism career. Endless hours spent in the trenches covering town board meetings for local papers were pioneered into a senior news editor position for a monthly magazine—all while cheering my kids on at softball games and band performances, and then moving them in and out of dorms and envisioning an empty-nested future as a travel writer. 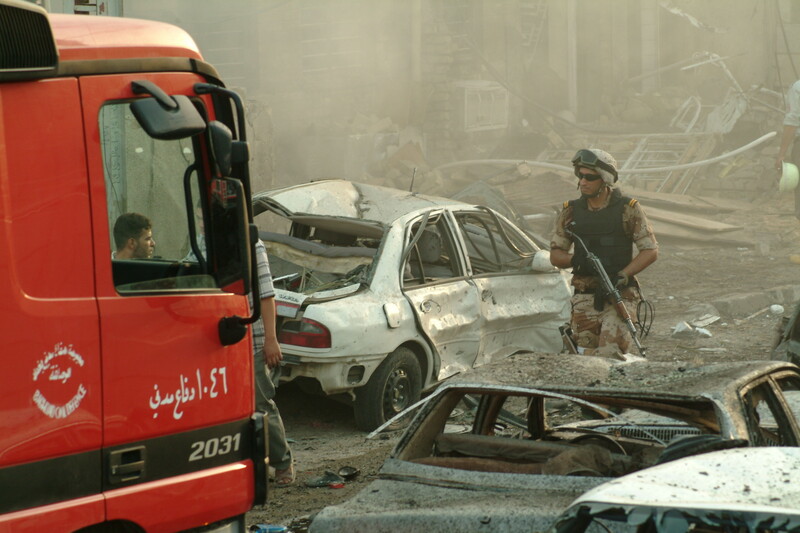 Eight years later, on February 3, 2003, I boarded a plane to Iraq, laptop and cameras in hand. Intent on photographing the faces of the people my government would soon be killing, I traveled three weeks throughout Baghdad and Basra, and to the Safwan-Kuwait border where coalition forces were about to enter Iraq. 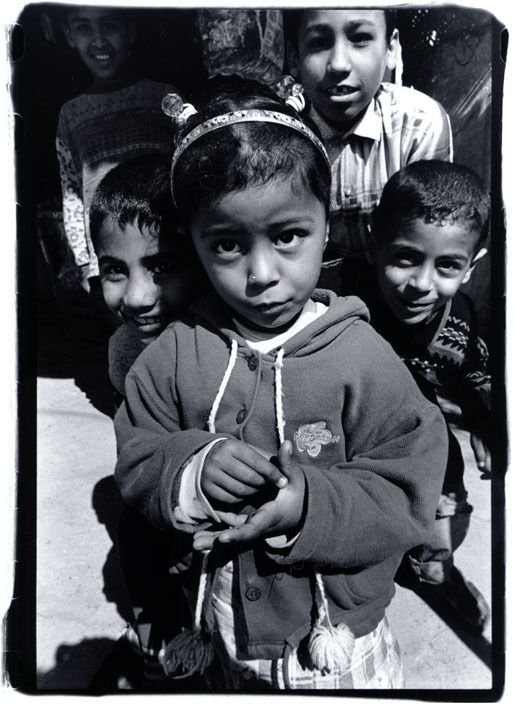 As bombs fell, I spent hours in my darkroom bringing to life 80 rolls of film filled with those faces. Driven, I went back again and again. I stayed in unprotected hotels, the main requirement an Internet lifeline connection. I was not interested in covering the usual explosions, bloodied or dead bodies, cemeteries, or morgues—the stories men build headlines and careers on; I wrote about the living. As a woman, a mother, and someone with a pre-war perspective, I could go where men could not, and tell stories most were not interested in telling. Products flowing over unchecked border crossings flooding the previously sanctioned country where nothing had entered: enough cars to pollute the air, electrical appliances—washing machines, hair dryers, electric heaters in a kerosene-fueled reality—all plugged in and crashing a heroically preserved but devastated infrastructure. Internet cafés sprouted in a country where citizens had never been allowed online. Satellite dishes bringing 500-plus stations replacing the three “I love Saddam” ones. The ignored horror tales of the wrongly detained screamed by a western humanitarian NGO to major media outlets—ignored, that is, until those naked Abu Ghraib photos splashed across front pages saw the same outlets blowing up the NGOs’ phones. I didn’t know what to tell the female Iraqi activists who asked me to bring more Western women with me to model modernity. I did have a heated Facebook exchange with a well-known male “war journo” poking fun, again, at “yet another middle-aged female journo in Mali interviewing the women and mentioning their hijabs.” I explained to him that war-zone women and children are the most adversely affected; and how in Muslim countries, the women are not allowed access to the mostly male media more interested in dead bodies, and the size of the wads shot and how far. 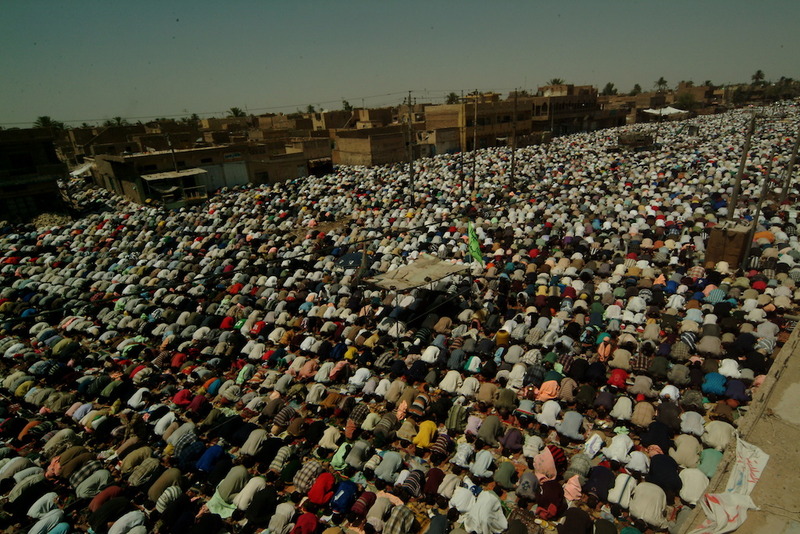 The only woman photographing the 10,000-plus prayer-rug-to-prayer-rug male crowd lining the street from a Sadr City mosque rooftop in 130-degree heat that stopped my film camera dead became a normal reality, as a dissonance grew between it and the Disneyland my America had begun to look like in my eyes. And although a bout of PTSD after almost being killed three times in the 10 days I was covering Iraq’s first election saw me grow my stateside photography business, I continued to seek stories, albeit safer, to tell in Iraq’s northern Kurdistan. Securing a master’s in International Relations in 2009—I wanted to know how the world worked—got me that moment’s dream job: telling the “success” stories of a USAID-funded project in Iraq. Several projects later, I am still here, wondering when or if I will be able to shake these faces that have grown into friends and whose stories still bring waves of urgency to tell. Lorna, you continue to amaze! Very impressive report, totally agree with you woman and children are the most affected in war zones,just see what is happening now in Mousil. Men fight, but the suffering is for those who most weak ones; woman and children. For me as an Iraqi, I have seen too much of this since 1980 till now; the question is : when will all ends?? why do Iraqi people have to fight for others? In the Iraqi- Iranian we were fight for the Arab Nation, now our fighting is expanded we are fighting for the whole world; well we Iraqis do not want to fight for any one no more , let every one fight his own war. Enough losing the best of our people for others, women, children and men. The fight with ISIS for our survival only , and the hell with rest of the world. Dearest Najed, I don’t have words to answer tour questions. Every person…man, woman, and child has been horribly affected by all of what you speak about… The stories of each of you is so heavy, so filled with pain and yet each of you keeps moving, keeps working to make Iraq a better place. Yes, Iraqis must do for Iraqis and to hell with the rest of the world. I cannot thank you enough for your friendship… it is a true gift. Lorna, you are still making a difference and keep it going. Courageous act and amazing pictures. Your’e such an amazing fighter dear Lorna. We miss you all here in Baghdad and wishing you the best of bests.